Christmas TV History would like to welcome guest blogger Dominic. He's my editor at 1701 Press. For last year's 1990s Christmas in July, he wrote about the Christmas episode of The Adventures of Pete & Pete and the movie The Nightmare Before Christmas. Remember those? Thanks to Dominic for contributing. Merry Sci-fi Christmas in July! I grew up in the 1980s and caught many of the decade’s cartoons. So, I remember watching Transformers, G.I. 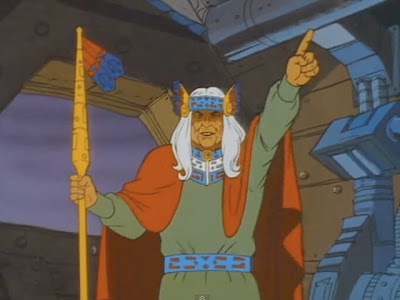 Joe, Thundarr the Barbarian, and He-Man and the Masters of the Universe, plus other stuff with comparatively fewer explosions like Heathcliff, and the Smurfs. BraveStarr somehow got by me, possibly because it was broadcast during a brief window in 1987 and 1988—or so says Wikipedia. By then, I was in 10th grade, and had moved on (mostly) from cartoons to reading Faulkner. No, really. I really did read Faulkner in high school. Unfortunately, that was the coolest thing on my high school resume. But had I seen BraveStarr, I’m sure I would have liked it, because it’s richer than the other sci fi cartoons of the time. As it happens, it’s Christmas on New Texas and BraveStarr has to go to Iron Mountain to investigate rumors of claim jumpin’. This is cause for anxiety for Judge J.B. McBride, the planet’s female judge and BraveStarr’s love interest. 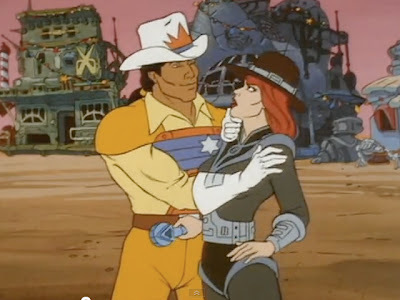 There’s a brilliant moment as BraveStarr is leaving when he embraces her, tenderly tilting her chin upward and leaning in to ki-… Do nothing. Apparently there’s no kissing on New Texas. Actually, the two do kiss in the BraveStarr movie, thereby saving the “A” material for the big screen. 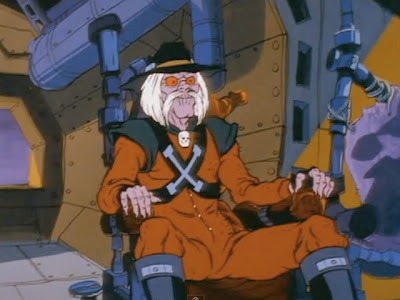 BraveStarr’s absence creates the opportunity for Tex Hex to take over Fort Kerium with Stampede’s backing, and support from the planet’s other baddies. However, before Tex gets started, he is visited by Shaman, a mystical Native American character with an electronic headdress, who materializes out of nowhere and is impervious to Tex’s laser blasts. Tex Hex at home, looking kind of Cryptkeeper-y. Shaman as the Ghost of Christmas Past, Present, and Future. Shaman is there to whisk Tex off on a series of temporal visitations in the style of Dickens’ A Christmas Carol. There’s still opportunity for Tex to mellow out and not wreck Christmas. By giving Tex the Scrooge treatment, we learn his back story. Visiting his past with Shaman, we are shown that Tex wasn’t always totally evil—he was young once, and in love! Although he tries to act tough, Tex is more than a little moved by the visions of his past with his true love, the beautiful and talented Ursula. 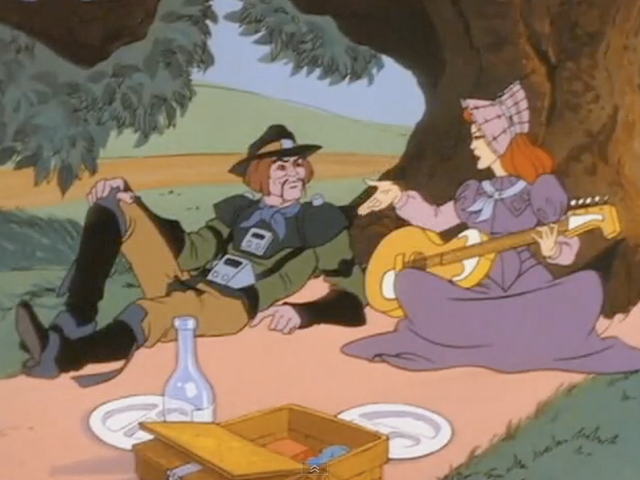 Despite her assurances that her love isn’t contingent on his financial success, Tex has Kerium fever and leaves Ursula convinced that he’ll return a rich man. Tex with the multi-talented Ursula. Shaman takes Tex on further journeys into his past, one of which shows Tex at his most evil: when he double-crosses his mining partner Angus McBride (Judge McBride’s dad), stealing their Kerium reserves and crashing the getaway spaceship. Enter Stampede, who, seeing Tex’s capacity for naughtiness, re-animates him, turning him into a Cryptkeeper-y mutant. Tex turned into a super-evil mutant henchman by the creepy-looking Stampede. Confronting Tex with the realities of Christmas Present, Shaman informs him that Ursula is in fact still alive, married, and living on New Texas, and that Tex’s nefarious plan will likely bring harm to her. Shaman also shows Tex the Christmas Future outcome of his greed and general crankiness: a lonely headstone with Tex’s name on it. Faced with this knowledge, and a demonstrable soft spot in his heart for Ursula, Tex drops the Scrooge routine and sabotages the attack on New Texas, even though he knows that Stampede will punish him. “Tex’s Terrible Night” is a fun retelling of A Christmas Carol—which wouldn’t seem likely spliced as it is into the context of a sci fi / western genre hybrid. 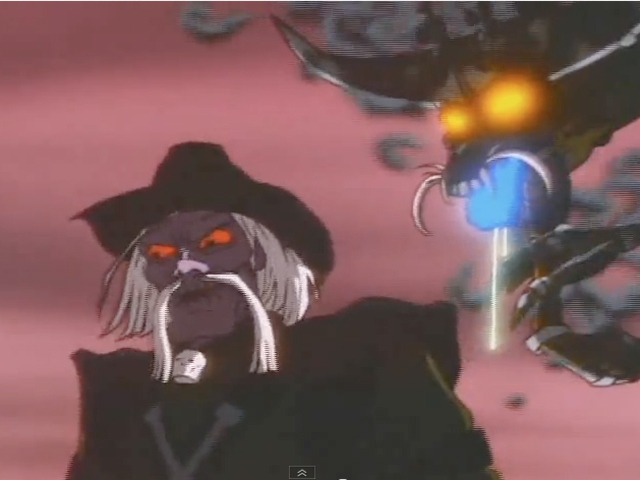 However, it works both as a Christmas episode, and as a part of the BraveStarr narrative. Unlike many of the cartoons of the time, BraveStarr had a rich, detailed back story with many characters, so “Tex’s Terrible Night” provides an interesting and sort of touching story for Tex Hex and Shaman. Okay, Faulkner it ain’t, but could Faulkner give you a delirious whirlwind of sci fi, western, and A Christmas Carol in under 22 minutes? Interesting. 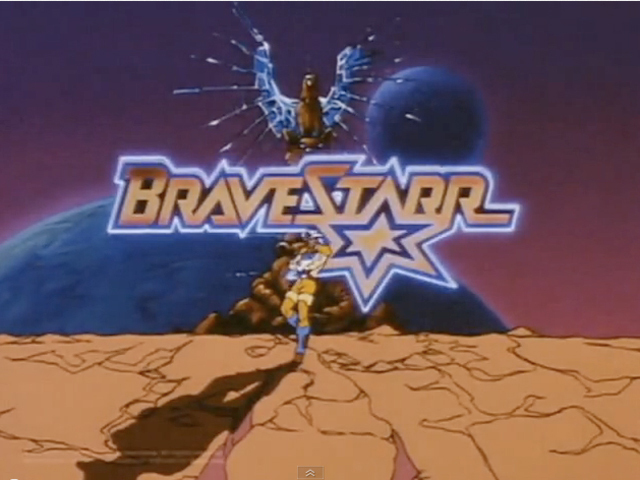 I never watched BraveStarr, barely even knew it existed. Cool that you found something quite rare to post on! I hadn't heard of it myself. Joanna recommended it to me, and I'm glad she did. I think it's a really interesting series. It seems more complex than a lot of the stuff I remember seeing. In a way, it seems like a precursor to where I imagine video games have gone these days (dunno for sure, as I stopped playing video games around the time of Sonic the Hedgehog). That is, video games all appear to have complicated, multi-layered backstories now. And yet, BraveStarr is still simplistic, moralistic and junky in that quintessentially 80s kind of way, which I love. Yep, I recall this one in bits, but yes I do like Charles Dickens story, now that we have the DVD set out we, can watch it. My other half and I.